Corsica will host its first Fab Labs! A concept that already has 472 locations worldwide, the Fab Lab digital manufacturing workshops pool a set of resources to design, produce and disseminate knowledge and know-how. The Corsica project was born through a public-private partnership and will be launched in June 2015. 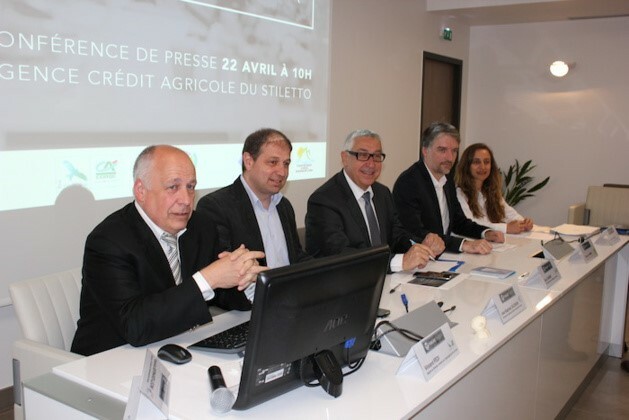 The Credit Agricole in Stiletto, Corsica presented the Fab Lab Corsica project. It was raved about with the calls of “revolutionary” and a “formidable tool for digital development.” The 473rd Fab Lab in the world, opening in the French island’s capital of Ajaccio, is about to revolutionize the landscape of new technologies for Islanders. Opening in June in Ajaccio and September in Corte. When open, Corsica Fab Lab Ajaccio will occupy 360m2 on the ground floor of the Caisse Credit Agricole of Corsica, and will be led by a team of 2 FabManagers. In June there will be introductions to digital manufacturing and workshops on how to use the machines and electronics. Robotics workshops will be introduced in September, to extend the actions of CampusLab which has dispensed such workshops for children since October 2013. 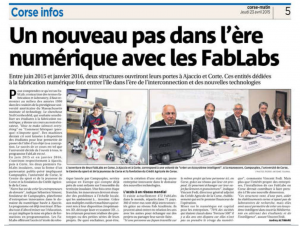 In early September, a second Corsica Fab Lab opens in Corte, driven by the University of Corsica and its Foundation, Fab Lab Connect. It will occupy 250m2 in the Palazzu Naziunale and will also be led by a team of 2 FabManagers. It will, in turn, enrich the academic training and research, promote the conversion project skills, and will consolidate recent strategy developed from local resources by a Designer in Fabbrica Design. Fab Lab Corsica does not stop there! The proposed opening of a Fab Lab in Bastia is already on track, in order to better cover the territory with this revolutionary new tool. “The Fab Lab is the starting point of how to design tomorrow’s world,” he adds. More than just a workshop, a Fab Lab is above all else a place of learning, exchange and dissemination of knowledge, know-how and skills. Each Fab Lab, connected to the global network, can indeed interact with all the others to find solutions to a problem, or bring their own solutions to others. Today, 71 countries in the world welcome Fab Labs. Soon it will be Corsica’s turn to host its first Fab Lab network. The project has been made possible thanks to the fruit of cooperation and the willingness of a “dream team” consisting of public and private partners, including the Sports Centre and Youth Corsica, CampusPlex, the University of Corsica and its Foundation, Fab Lab Connect, Fundazione, and Credit Agricole of Corsica, the first financier of the operation.